The Vaporesso EUC - Eco Universal Coil is an innovative performance atomizer created with affordability in mind. It is intuitive created, changing the way users typically replacement the atomizer coils. Vaporesso Zero Pod System Starter Kit Features a built-in 650mah battery is built in and 1.6ml juice capacity, it also comes with a quick charging system. The Vaporesso Nexus AIO Ultra Portable Kit is a creatively built all-in-one hardware kit in the market. Vaporesso Luxe Kit comes with an large 2.0 TFT colors screen, supported insta-fire 0.001s and super player mode. Included Vaporesso Skrr Tank has 8ml e juice capacity, coming with innovative QF Air Distribution System. Vaporesso LUXE 220W Touch Screen TC Box Mod combines elegant aesthetic with beastly power, features 2.0 inch TFT screen that display valuable vaping data. Powered by dual 18650 batteries, the Vaporesso LUXE is capacable of 220w maximum wattage. Vaporesso Armour Pro Kit is powered by single 21700/20700/18650 battery and max output 100W. Vaporesso Orca Solo AIO Starter Kit is powered by large built-in 800mAh battery and with 1.5ml e-juice capacity, coming with a metal sleeve at external of atomizers and accept top filling system for easy operation. 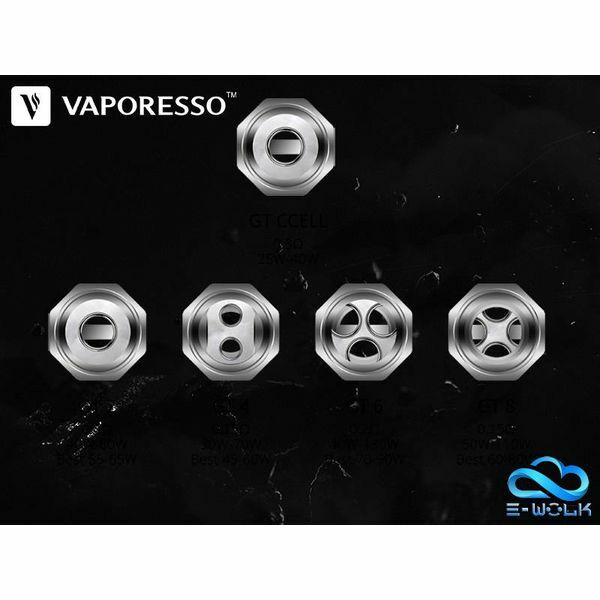 Vaporesso Orca Solo CCELL Replacement Coils is special design for Vaporesso Orca Solo AIO Kit.